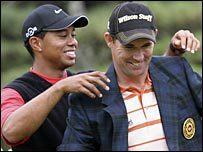 You could never imagine Padraig Harrington, the ultimate grinder, losing the will to fight the way Woods did on Friday. The Dubliner says he’s close to finding his best stuff and he painted a vivid picture of the current state of his game with a second successive 72 in which he sprinkled an eagle and three birdies between nine pars and five bogeys. Harrington is eight shots behind leader Billy Mayfair (68), who leads by a single stroke on eight under from Angel Cabrera, who played in the same group as Woods and outscored him by 12 shots with a second round 67. As for Rory McIlroy, who showed just why Woods and others tipped him as a possible successor when he spectacularly eagled his 16th hole (the par five seventh) to avoid missing his third cut on the spin. Disheartened by his early season form, McIlroy needs only the faintest spark of brilliance to reignite the fire of confidence and having slipped outside the cut line with bogeys at the fifth and sixth his (14th and 15th), the world No 13 produce the kind of shot that leaves his caddie JP Fitzgerald open-mouthed from time to time. It might be the second easiest hole on the course but McIlroy still had the skill and the guts to follow a 304 yard tee shot with an impressive 208 yard approach to six and a half feet. He holed the eagle putt and parred in for a 73 to make it on the mark. Just nine shots separate leader Mayfair from the 30 players who are log-jammed in a share of 48th and last place on one-over. Woods didn’t even come close to surviving as he finished on nine over par in only his second event since taking a break from the sport. What will happen in the Players at Sawgrass next week is anyone’s guess. 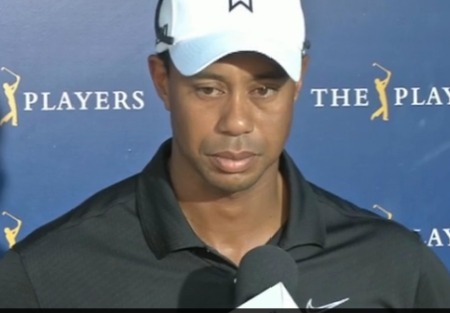 According to Doug Ferguson of the Associated Press, Woods had only missed five cuts in 240 starts as a professional prior to this event. He had three-putt bogeys on consecutive holes. He hit a flop shot that ran over the green and into the water. And he bottomed out on the 15th green with a four-putt double bogey from just over 30 feet. His last early exit came in the Open at Turnberry last year. 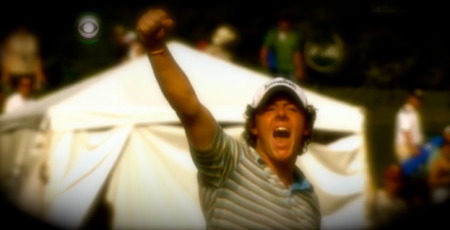 Before that it was the 2006 US Open shortly after the death of his father Earl. 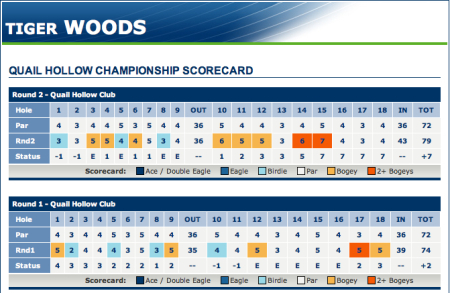 Woods’ last missed cut in a non-major was at the 2005 Children’s Miracle Network Classic at Walt Disney World. Any faint chances of avoiding a sixth missed cut disappeared on the 14th when he ran up a double-bogey six, missing the green and then pitching into the water. And another double bogey on the next had the American in danger of surpassing his worst score as a professional - he shot 81 in horrendous conditions in the third round of the Open at Muirfield in 2002. At the other end of the leaderboard, Billy Mayfair leads the way at eight under after another round of 68, with last year’s Masters winner Angel Cabrera one shot back after a round of 67. JP Hayes shot the best round of the day with a 64 to take him into a share of third place alongside, among others, new Masters champion Phil Mickelson. Jet back to Seville Darren, you've made the cut!